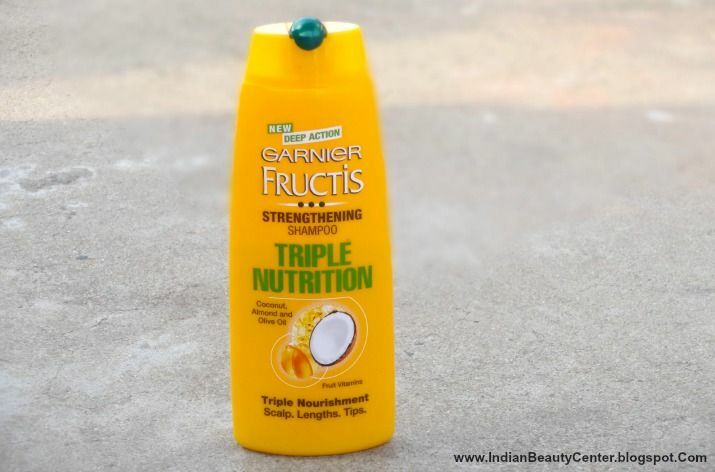 Claims : Garnier Fructis Triple Nutrition is a first of its kind product that combines the power of all three oils and fights against all hair care worries. The product consists of a triple action formula that nourishes & strengthens hair from root to length to tip. 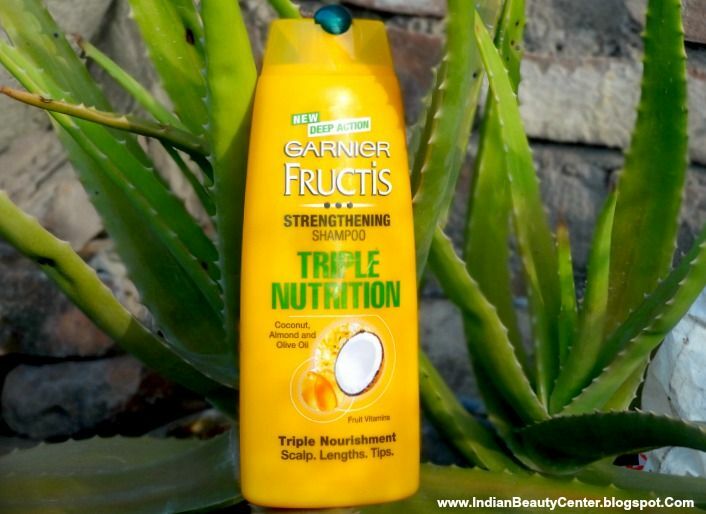 Nourish your dry and damaged hair with Garnier Fructis Triple Nutrition Shampoo. It is enriched with the goodness of three nourishing oils of olive, coconut and almond. The Vitamin E from these oils help moisturise the scalp and get rid of the dryness. I was left extremely curious when I saw the advertisement for this shampoo on television. So, I finally decided to try this shampoo and after one full month of experimenting, I can say that this shampoo is incredible. 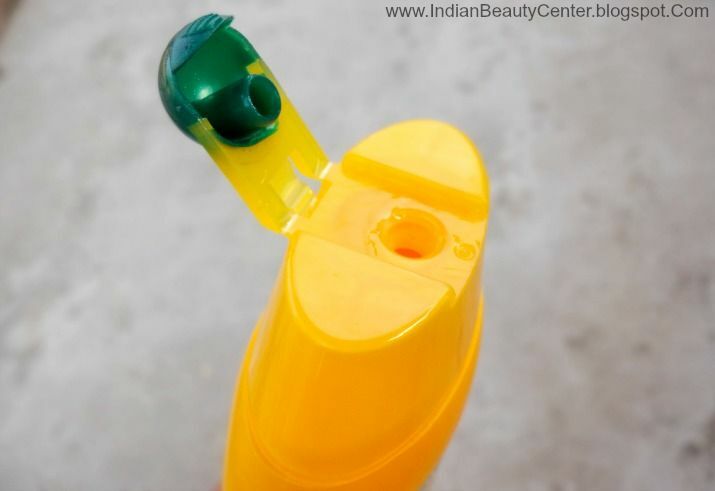 Garnier has come up with an attractive yellow colored bottle for this hair cleanser. The bottle is not travel friendly as the flip-open cap is not that tight. 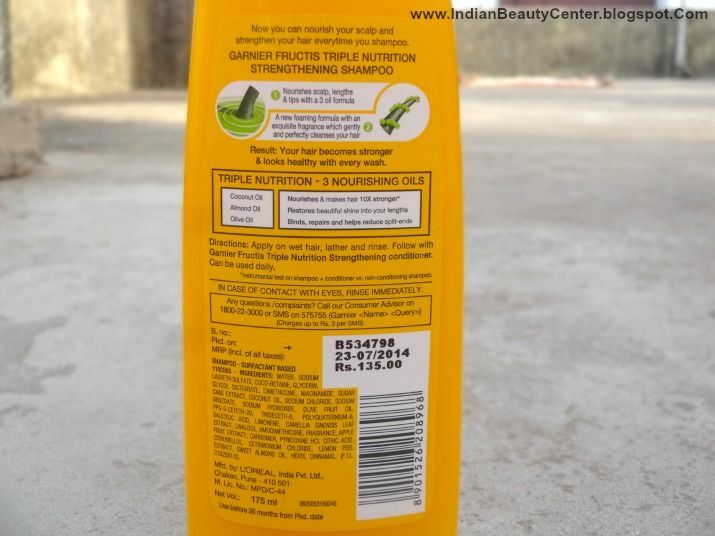 When I purchased this shampoo, I checked out the ingredients list first and was a bit disappointed to find the silicones and sulphates mentioned. The aroma of this shampoo is fruity and sweet and I can relate its fragrance to that of TRESemme shampoos. It is runny in consistency and pearly white in color. 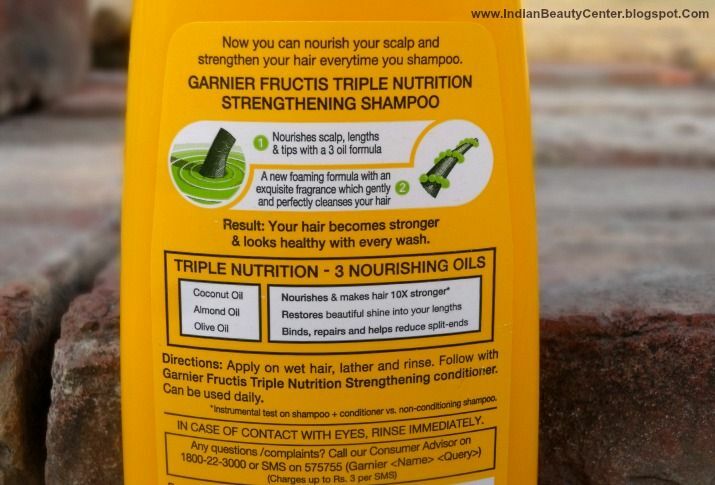 Garnier triple nutrition shampoo contains 3 nourishing oils - coconut oil, almond oil and olive oil. It lathers really well and I keep it for a minute on my hair and scalp before rinsing it off with cool water. My mane feels properly cleansed and the best thing about this shampoo is that it does not dry out my hair. Besides making my hair dirt-free, this also adds a shine to my hair. My tresses feel healthy, soft, smooth and silky after using this shampoo. The smell does not last long in my hair. After having used this on my scalp, length and tips for over a month, I feel that my hair feels much better. The effects of the shampoo last for about 2 days on my hair. The impact of this hair cleanser is temporary and so I have to use it every other day to maintain the effects. I generally use a conditioner after using this but sometimes skip it when my hair feels moisturized. You can use a serum after having washed this off for lasting shine and softness. This is a great shampoo from garnier fructis that has never weighed my hair down. It does not repair split ends but adds a shine to the hair and makes them soft and manageable. Do not expect much damage repair from this. It just removes the dirt and grime from your hair without drying it out and helps maintain the hair. I've tried Garnier Fructis shampoos & conditioners and I love the smell of all of them! They're great & cheap shampoos, but I've haven't tried this one with coconut oil, probably because I haven't seen this in stores where I live. But rating is good, sounds promising!